A genius, the owner of more than 146 American patents, the inventor of Tech-BIA (bio-information adjustment technology), the inventor of bio-medicines for various incurable diseases, the inventor of eco-friendly bio-fertilizer and comprehensive and efficient eco-environmental treatment, chief scientist of CK Life Sciences Int'l., Inc. and more. To most people, these are some of the many outstanding accomplishments of Professor Larry Cheung (Zhang Lingyu); but after a few close contacts with the professor and his team, we realized that there is something else he cares about much more than these worldly titles. For more than 30 years, Professor Cheung has been engaged in bio-information research. The Tech-BIA Technology is an innovation in life science research, which is established on the basis of information changes between living active materials (such as a living cell, a living protein and a living gene) and dead inactive materials. To date, the technology has been widely used in the fields of bio-medicine (62 scientific achievements), comprehensive and efficient eco-environmental treatment, and bio-agricultural standardization. Compared to conventional life science research technologies, the Tech-BIA Technology platform is known for its quickness, accuracy, low-cost wide application and safety. Professor Cheung's main discovery is that edible yeasts cultured in an electromagnetic field with a certain frequency range can change the life information of the living active materials; and when this technology is applied in different areas, diseases can be cured, the natural balance of soil can be restored, and contaminated water systems can be cleansed. In fact, the significant changes brought by Tech-BIA have already been seen in 16 countries around the world. While most people, even scientists, found it hard to believe that Tech-BIA works, Prof. Cheung and his team of scientists managed to prove the existence of the invisible yet adjustable "nformation" with concrete and traceable data. After many years of misunderstanding, rejection and ignorance, on February 8, 2007, a new bio-medicine based on Tech-BIA technology for the treatment of AIDS was approved by China's FDA (Food and Drug Administration) for clinical trials. Up till now, this is the only biological formula of AIDS treatment that has proved to be clinically effective in China and the world. Different from most currently available AIDS treatments (vaccine or anti-viral drugs), Professor Cheung's Bio-AIDS treatment repairs the human immunologic system with multi-molecules and channels while at the same time isolates the virus and then leads it to perish naturally. It does not cause any drug-resistance and can quickly improve the human immunologic system. Its bio-activity is managed by a combined quality control method (including traditional Chinese and Western medicine), which is completely traceable and controllable. The condition of patients using Tech-BIA-based bio-treatment seems much more optimistic than that of those treated with conventional medicine. Most of these patients who were infected through blood transfusion are now living healthful lives. In fact, the HIV virus in some of the patients is no longer detectable. After taking the bio-treatments most patients experience a swift recovery of their immune system, prolonged control of the virus titer, rapid regain of CD4 levels, and great reduction of pain. In addition, because the bio-treatment is completely natural and harmless to the human body, it doesn't cause any side-effects to patients and can even alleviate their suffering. Patients only need to spend $1 a day to treat AIDS, which is affordable for most people. Professor Cheung told us that this means a lot to people in poor countries, because that's where most of the HIV-infected populations live and urgently need help. " made a vow to extinguish AIDS in all corners of the world and our first target will be the eight million AIDS patients in China. Our ultimate goal is not to make our research a commercial product, but more importantly, to offer the medicine to patients free of charge," he said. 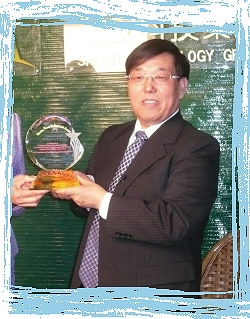 In May 2008, Professor Cheung was presented the Shining World Invention Award by representatives of The Supreme Master Ching Hai International Association on behalf of Supreme Master Ching Hai. He also received some of Master's publications, and a DVD of the Supreme Master TV program "Good People Good Works" featuring his achievements. Supreme Master TV recorded the ceremony and interviewed Professor Cheung about the latest developments in his inventions. He was extremely touched by Master's warm words of encouragement and support. He said: "Through the interviews I have had with Supreme Master TV, I am genuinely moved to know that there are still so many people in this world caring about our planet and Master is leading so many fellow practitioners to care about our world. This is an immense encouragement to my work. I sincerely hope that I'll have the honor to meet Master Herself one day, because I believe with Her guidance I will be able to contribute more." It has been such an honor to have met this saintly scientist and to have had the chance to share his compassionate scientific concepts with the people of this world. We pray for Heaven's mercy so human beings advance speedily through this special time and elevate to a new level of consciousness.